Sunday-in-the-garden was severely truncated because of an I-ran-over-my-iPhone-with-my-truck-after-it-fell-out-of-stupid-new-holder incident, which resulted in two hours away at the ATT store replacing phone at my own cost despite them having sold me the stupid holder the day before. But still managed to make some progress with the what-will-be flower garden. 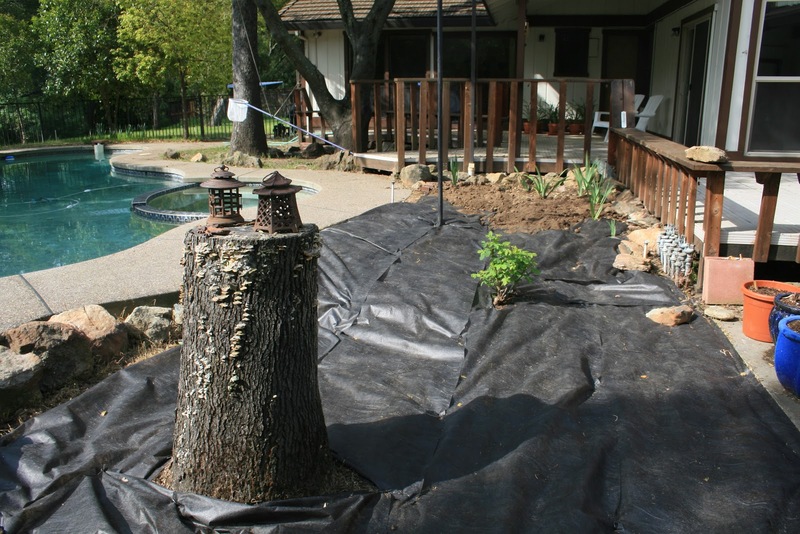 Covered the area with weedblock fabric to prevent any pre-existing weeds from coming through. The fiercest and strongest will eventually fight their way through it, but it's a good hindrance and will allow me to keep them under control more easily. It's pegged down around the old tree stump and around the rose bush that Jade gave me which safely survived the move. It has flower buds! Now I just have to move all the topsoil, barrow by barrow, from the driveway. And then... let the planting begin!